Among the many spotted enjoying the Go Red for Women Luncheon were from left, seated, Kathie Wiley, Becky Day, Emmeline Dodd and Karen Reed; standing, Kimberley Fleming, Anita Fogtman, Karen Keesler, Sandy Records, Kim Barker, Ellen King and Ann Brannen. THERE’S NOTHING quite like it, our Go Red for Women Luncheon. You walk in, and there before your wondering eyes is a sea of red – lovely ladies in fashionable red outfits, mingling with handsome men in black suits and red ties. All for a wonderful cause: to raise money to help the American Heart Association. 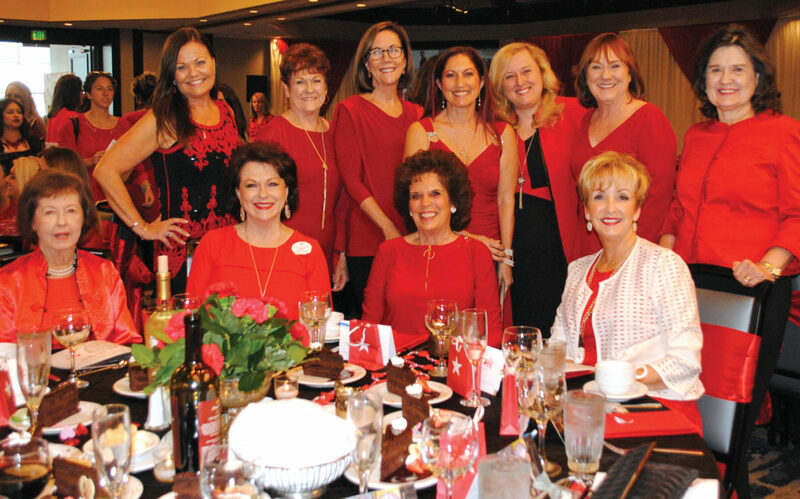 And, best of all, the 2017 Go Red for Women Luncheon raised more than $200,000 for the fight against heart disease and stroke, AHA Gulf Coast Division Communications Director Michelle Mason told us later — $40,000 more than last year. 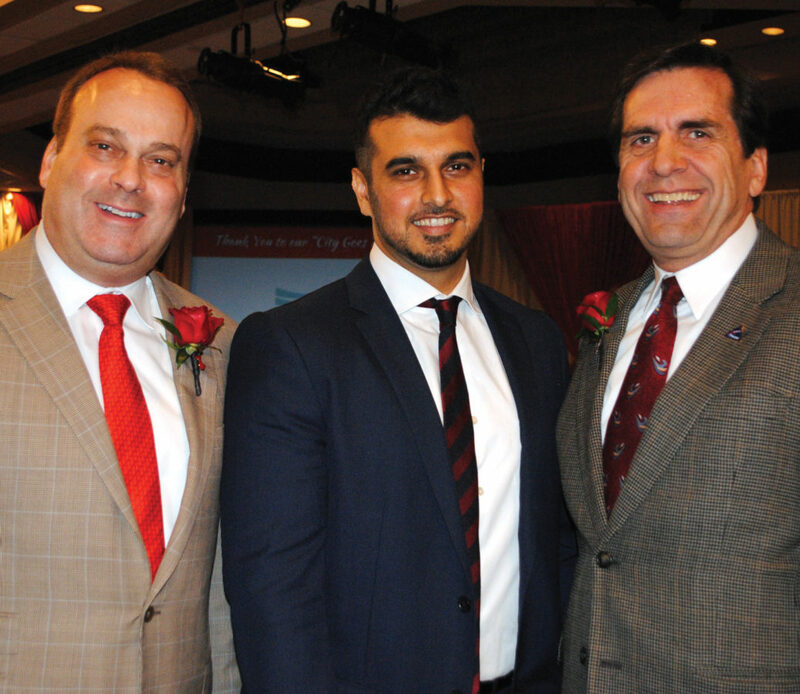 Men Go Red Chairman Jim Sweeney, right, welcomes Bay Area Regional Medical Center Chairman Dr. Michael Lyons, left, and Dr. Rizwan Chaudhry, a 2017 Heart Throb, to the Go Red for Women Luncheon at South Shore Harbour Resort. This year’s luncheon, chaired by Senior Vice President of Business Development and Marketing at Bay Area Regional Medical Center Santiago Mendoza Jr., had its biggest crowd yet with nearly 500 guests filling the South Shore Harbour Resort Crystal Ballroom to nearly overflowing. Walking into the foyer, you might have bumped into Co-Chairmen Darcy Whatley, Theressa Riggs, Tama Brantley and Goinar Doroudian, who were busy checking with Heart Throb Chairman Sandy Adams, Open Your Heart Chairman Fay Picard, Auction Chairman Laurie Dahse and Fashion Show Chairman Stephanie Rice to make sure all was ready for the arriving crowd. As were Event Committee members Amanda Fenwick, Brandy Gates, Melissa Vidrine, Teresa Provis, Hilary Hart, Kelsey Richardson, Elizabeth Quigley, Donna Orozco and Abbey Lee. Wasn’t long before we spotted Karen Reed, Emmeline Dodd, Kathie Wiley and Anita Fogtman as they checked in before tagging up with Karen Keesler, Becky Day, Kimberley Fleming, Ann Brannen, Ellen King, Sandy Records and Kim Barker. En route to their table, they passed three tables of folks from the University of Houston-Clear Lake including attorney and alumnae Marilyn Sims, Leigh Ann Shelfer, Mary Sue Anton, Karen Barbier, Joyce Delores Taylor, Mary Ann Shallberg, Alex Malone and Theresa Presswood. Lots of physicians in the happy crowd, too, including Dr. Rizwan Chaudhry and Dr. Larry Cato representing Bay Area Regional Medical Center, Dr. Kyle W. Stephens representing Houston Methodist St. John Hospital, and the 2017 Heart Throb winner, Dr. Matthew Higgs, representing All American Orthopedic & Sports Medicine Institute; and Bay Area Regional Medical Center Chairman Dr. Michael Lyons. Circle of Red Co-Chairmen Tama Brantley and Darcy Whatley and Men Go Red for Women Chairman Jim Sweeney also circulated through the crowd, stopping to visit with first one and then another before Ch. 2’s Syan Rhodes took the stage to emcee the program and fashion show, which featured JoAnn Armstrong, Meloney Bee Bean,dSandra Cruz, Keishia Gatson, Janice Gunnin Wilson, Kimberly Ito, Linda Reppert, Rita Torres, Sandy Williamson, Geraldine Zidek, Debbie Robinson, Rhonda De La Moriniere and Veronica Weir. Men Who Cook chefs Barry Terrell, Rick Clapp, John Collins, Chip Boettler, Hans Mair and Chris Kurzadowski, from left, prepare to serve the crowd at Lakewood Yacht Club in Seabrook. Meanwhile, Seabrook men were busy cooking . . . 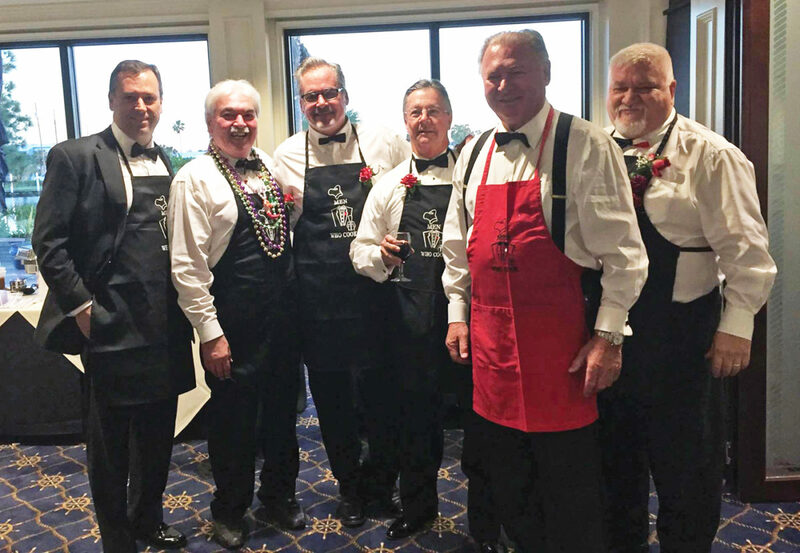 WHILE THE WOMEN were all in red, the Seabrook Men Who Cook were busy getting into their black and white chef outfits and serving a delighted overflow crowd at Lakewood Yacht Club. Mostly, they work like old pros, and truthfully, they are. Many have been serving up delightful dishes for years. Longest serving are Hans Mair, owner of the Sundance Grill II, and Rick Clapp, Bay Area Houston Magazine CEO, who have been celebrity chefs for 21 years. Some of the other long-time chefs include Tom Davis and Charles Clemmons, 19 years; Mike DeHart, 18 years; and David Imbrie, 16 years. Many others have multiple years of pleasing the crowd – Trey Hafely, Chip Boteler, John Collins, Chris Kurzadowski, Steve Hegyesi, Thom Kolupski, Kim Morrell, Tom Diegleman, Michael Giangrosso, Darrell Picha, Paul Dunphey, Gary Johnson, Warren Rocky Miller and Rick Wade. Proceeds benefit the Seabrook Rotary Foundation and the Seabrook Police Department Association’s charities. Clear Lake Area Chamber President Cindy Harreld DeWease, second from left, asks Chris Wallace, center, president of the Texas Association of Business and speaker for the chamber’s Government Affairs Committee Luncheon, to pose for a photo with, from left, Brian Freedman, Chamber Chairman Carl Joiner, and emcee Lisa Holbrook, who is chairman of the committee. 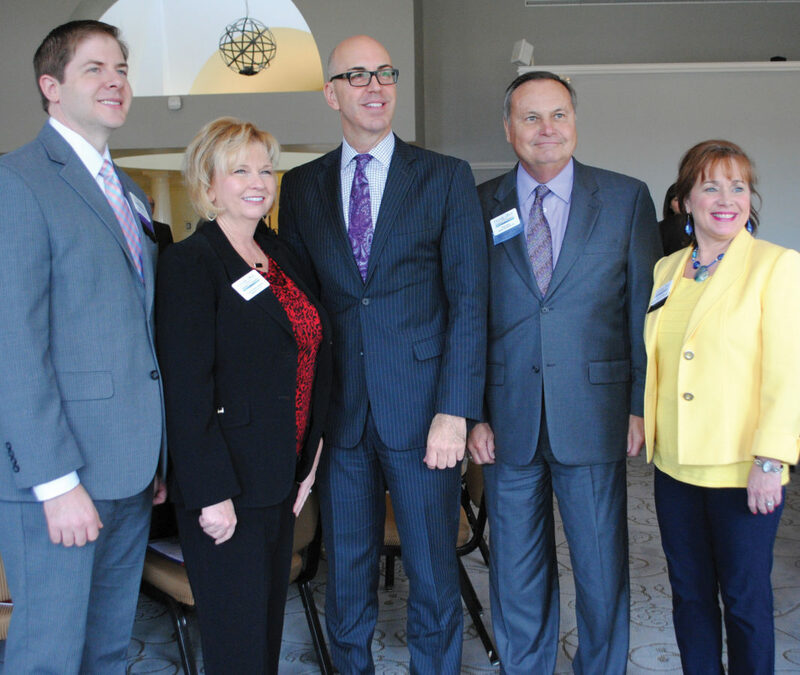 THE CLEAR LAKE Area Chamber had a very special speaker at its Government Affairs Committee Luncheon — Chris Wallace, president of the Texas Association of Business, who listed the TAB’s 2017 legislative priorities. Lisa Holbrook, who has been active in several legislative sessions as a key aide to former State Rep. John Davis and now serves as president of the Texas PTA, emceed the event and introduced the speaker. Covering an amazing amount of ground, he quickly stressed how important education is, promising to work to raise education standards across Texas, support both full day Pre-K and the training of community college students for jobs in the workforce and higher education. He supports the proposed Coastal Barrier to protect the Gulf Coast from storm damage, he said, opposes the bathroom bill and advocates for quality health care and access to choices of care. And, that was just some of his many priorities. All in all, an interesting event.